This easy main course is perfect for New Year or Burn's Night entertaining. Put the chicken breasts in a large, non-metallic bowl. Finely chop half the sage. Whisk the olive oil and lemon zest and juice together and stir in the garlic, sage and sultanas. Pour over the chicken and mix well. Cover and chill for at least 2 hours, or overnight. Preheat the oven to 190°C, gas mark 5. Transfer the chicken and the marinade to a roasting tin and spread out in a single layer. Tuck in the pieces of black pudding and remaining sage leaves and roast for 25-30 minutes, until the chicken is cooked through and there is no pink meat. 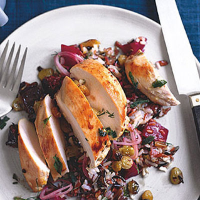 Serve with spiced beetroot and wild rice salad. This tray bake would be just as delicious made with pork chops instead of chicken.